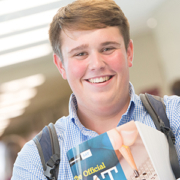 Fifty-seven percent of the class of 2014 took the ACT, nationwide. That’s 1,845,787 students, which adds up to a lot of data for the ACT. The ACT recently released its annual Condition of College and Career Readiness report for 2014, which uses that data to draw conclusions about the graduates of the class of 2014, how ready (or not) they seem to be for college, and what educators can do to improve those numbers. The numbers for Kansas and Missouri were comparable – 75% of Kansas students took the ACT, with an average composite score of 22, while 76% of Missouri’s class of 2014 took the test, with an average composite of 21.8. Nationwide, average scores varied from 18.9 in North Carolina (one of 12 states in which all 11th grade students are required to take the test) to 2.3 in Massachusetts, where only 23% of students took the test. The major purpose of the report, though, is not just average composite scores; the report is centered around college readiness. The ACT has adopted benchmarks in each of the four subject areas – English, Math, Reading, and Science – which predict students’ “likelihood of experiencing success in first-year college courses.” According to the ACT, a student who meets the benchmark in a subject has a 50% chance of earning at least a B, and a 75% chance of earning at least a C, in a first-year course in that subject. For 2014, those benchmarks are 18 for English, 22 for Math and Reading, and 23 for Science. In the class of 2014, only 26% of students met all four benchmarks, while 31% met none. These numbers obviously present a challenge for educators – what can be done to ensure that students are ready for college when they graduate? The ACT has a few answers. First, students should take more rigorous classes – starting in eighth grade. In addition, high school classes should include a recommended core of classes, including four years of English, three years of math, three years of science, and three years of social studies. The difference in college readiness benchmarks between students who do take the recommended core classes and those who don’t is significant. For example, 46% percent of students taking the recommended number and type of math classes met the Math readiness benchmark of a 22, but only 8% percent of students taking fewer math classes did. The ACT report actually suggests making those core classes mandatory for high school graduation. In addition, students with a self-reported interest in STEM fields are more likely to meet readiness benchmarks in all areas, not just Math and Science. Thirty-four percent of students with an interest in STEM meet all four benchmarks, compared to 26% for the whole class of 2014. The ACT suggests increased support for STEM-related courses, and active encouragement of students to pursue those fields. The report correctly points out that demand for STEM-related jobs is expected to increase significantly (8.6 million jobs by 2018).